What is the Cleft Lip and Palate Service? The NHS Cleft Lip and Palate Service provides specialist support and clinical care to people with cleft lip and/or palate and their families from diagnosis to adulthood. Adult patients who have received surgery in the past may return for further treatment at any age. Psychological support and genetic counselling is also available for families of people with cleft lip and/or palate. 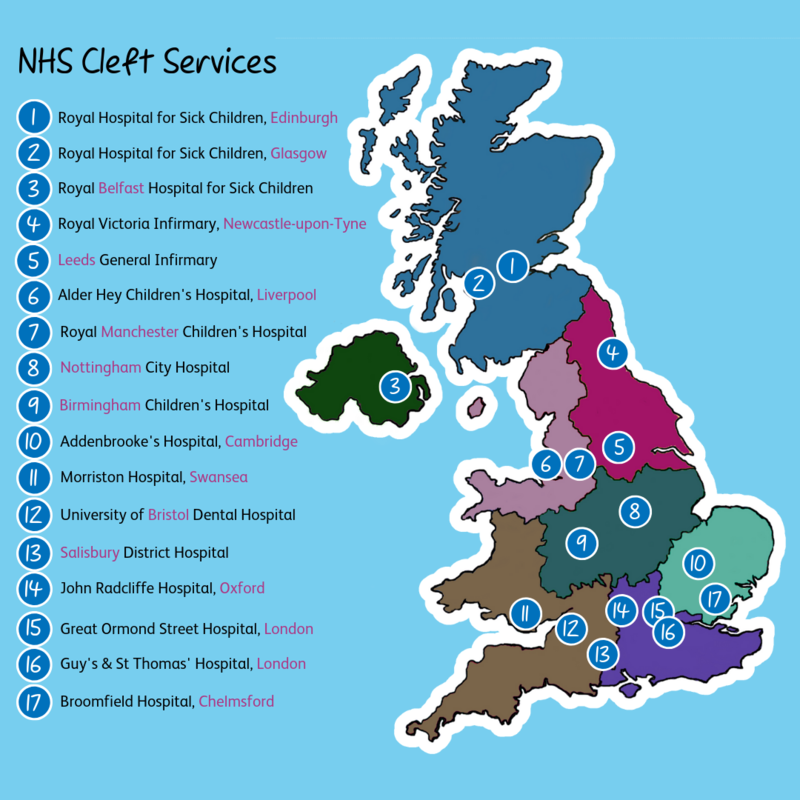 There are 9 Cleft Services around the UK. Within these, there are individual Cleft Units (or Cleft Centres) within hospitals which are staffed by Cleft Teams. These teams of cleft specialists are sometimes called ‘Multidisciplinary Teams’ or ‘MDT’s, which simply means there are a number of specialists from different disciplines (e.g. plastic surgery, dentistry, psychology) all working together. These centres are supported by local cleft clinics around the region. The specialists in each team, as well as where they are based and what they do, will vary from place to place. Like most NHS specialist services, Cleft Teams usually need a referral from another service like a GP or midwife in order to take on new patients. Newly diagnosed babies, and expectant parents who have just received a diagnosis, should be referred to their nearest Cleft Team very quickly, usually within 24 hours. Older children with a late diagnosis of cleft palate may get a referral from their GP. Adults or anyone who has left the service will usually need to get a referral from their GP or dentist for further specialist treatment. More information. For help and support in the Republic of Ireland, contact CLAPA Ireland.